How to draw an angry face and keep smilling! 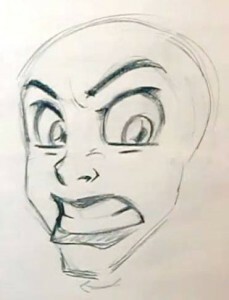 Want to learn how to draw an angry face? First, draw the basic head shape just like you’ve done all throughout this lesson series. 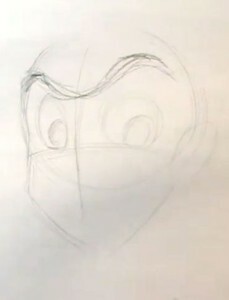 The important thing with this step is when you start to create the line that the eyebrows follow.Because the head is a sphere the curve of the eyebrows can be a little tricky to get looking right. Because this expression is a little more extreme, you’re going to push the upper eyelids a little further than you have in previous lessons. 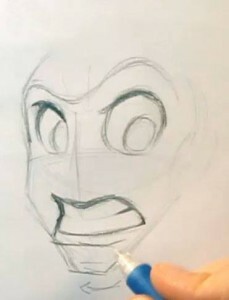 When learning how to draw an angry face, the mouth is going to get the same extreme treatment. You can show this by pushing the lower jaw out ever to slightly past the edge of the upper jaw. Finish up with the angry pose by first drawing in the lower eyelids raised against the eyeball. If you make an angry face in a mirror you’ll see that as your cheeks are raised up the expression of your mouth the lower eyelids narrow the eyes.For the last part of our tutorial on how to draw an angry face, add some quick lines just above the nostril to give an indication of the nose being scrunched up. This will help sell the angry pose, and is another example of where simple modifications can make all the difference in your expressions. If you take away those two little ticks above the nostril the nose goes from scrunched to relaxed. And we’re done! We hope this tutorial has helped you learn how to draw an angry face. Why not share your art in our community?